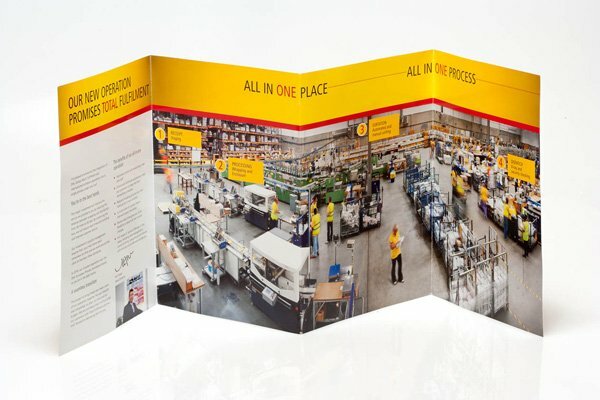 I was recently commissioned by a design agency in Cornwall to create a series of images to suit a promotional brochure for DHL, who are a worldwide distribution and logistics organisation. After doing a site recce, and agreeing terms with the agency, I set to work in the DHL warehouse, a hub for initial collection, sorting and re-distribution of all manner of packages from letters to large crates going worldwide. It’s busy, busy, busy! Challenge? – bring it on! I love a challenge and this was no exception! The agency brief was to capture the constant flow and stream of activity in the warehouse space and to make the image balanced and interesting. This could be tricky from a standing viewpoint even though I’m over 6′, so I suggested that we shoot from a medium level gantry looking across and slightly over the scene. This opened up the entire area visually and enabled me to create the vista in sections. The panoramic image suited the brief perfectly as you can see in the finished brochure. Sometimes a photographer needs to break the accepted technical conventions and rules to achieve the right image to fit a brief, producing something creative and technically exciting but also a successful interpretation of the designers idea. Furthermore the final shot should give the recipient of the brochure a new perspective on what could be deemed to be an ordinary daily work scene. This defines a working image. An artist just knows when all of the elements and angles, juxtapositions of objects, space and colour all work together to create a balanced composition. My engineering background helped me to view the warehouse space with an analytical eye, where I could easily see the challenges ahead. With 25 years of photographic experience behind me and my in-depth knowledge of industrial environments and settings, I could assess and calculate what was required to achieve a striking and useful image. The warehouse staff obviously couldn’t be asked to stop working and clear the site while I was shooting (time and tide waits for no man, and never more so in distribution and logistics! ), so I decided to use my post-production skills to compose the individuals into the scene as a secondary tranche of work. See the results here. I also used some advanced stitching techniques to achieve the agency specified panoramic dimensions. Day 1: Site recce and planning. Technical and artistic proposal submitted and agreed with commissioning agency. Day 2 and 3: On site shooting scene. Liaise with design agency. Day 4 and 5: From selected scenes, post production work to achieve final result and supply high res images to agency via ftp for design and artwork. Result: Panoramic image plus set of supporting images. ‘We chose Working Images for this challenging project as we needed a technical and creative expert to bring our idea to life. Chris Honeywell’s proposal was compelling. We were delighted with the service we received and end-product alike. If you’ve got an idea but you’re not sure how to achieve it, commission Chris Honeywell.